All Erasmus students have access to a special promotion: 25% discount of the service fee* in over 30.000 rooms from Lisbon to Paris, London to Valencia, Bologna to Nottingham - and pretty soon all over Europe! Don't forget to use the promocode when at the "Pay and Book" page. Register your ESNcard or log in to have access to it. Uniplaces is an online marketplace for booking student accommodation with thousands of verified properties. The simple booking process is done online and can be done months in advance - students being able to secure accommodation in a city they haven’t arrived to yet and don’t even know is the key that opens the door to this new experience. In a way that is safe, trustworthy and with consistent quality, Uniplaces provides easy-to-find, easy-to book accommodation. This helps to make any international student’s experience memorable: with value-added initiatives that’ll make that experience unforgettable. In addition Uniplaces and ESN are together breaking down barriers to student mobility, with the Living the Dream Scholarship, the first-ever crowd funded scholarship for student accommodation, and the Uniplaces Academy. 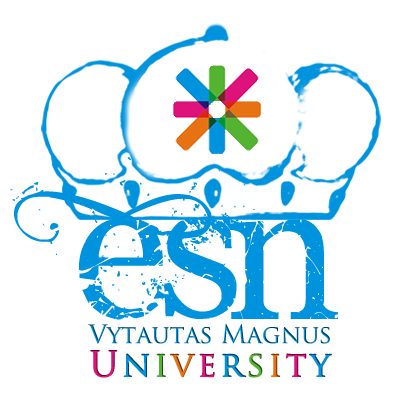 Erasmus Student Network in Vytautas Magnus University (ESN VMU) is a non-profit international student organisation. Our mission is to represent international students, thus provide opportunities for cultural understanding and self-development under the principle of Students Helping Students.